In the highly competitive world of online real estate marketing, having an attractive website is not enough to ensure your success. The appearance of your real estate website does matter, of course, because often that first essential impression will determine whether visitors will continue on to explore the rest of your website (and eventually become a client). Once visitors enter your website, though, appearances alone aren’t going to keep them engaged and moving through your pages. To achieve that, you need a carefully planned real estate website design that has elements and behaviors specifically crafted to engage your real estate clients and advance your marketing aims. We’ve identified four tips for a more effective real estate web design that will help you create a high-performing marketing tool that will help ensure your success. Try them and let us know how well they work for you! Google’s Digital House Hunt found that 89% of new home shoppers use a mobile search engine at some point during their research process. To capture the attention of these digitally savvy home buyers, you need a mobile-friendly real estate website that provides an easy, enjoyable user experience on all mobile devices. When you choose a responsive real estate website design, you have the peace of mind that comes from knowing your website will automatically adjust to perform perfectly on every type of mobile device for years to come. 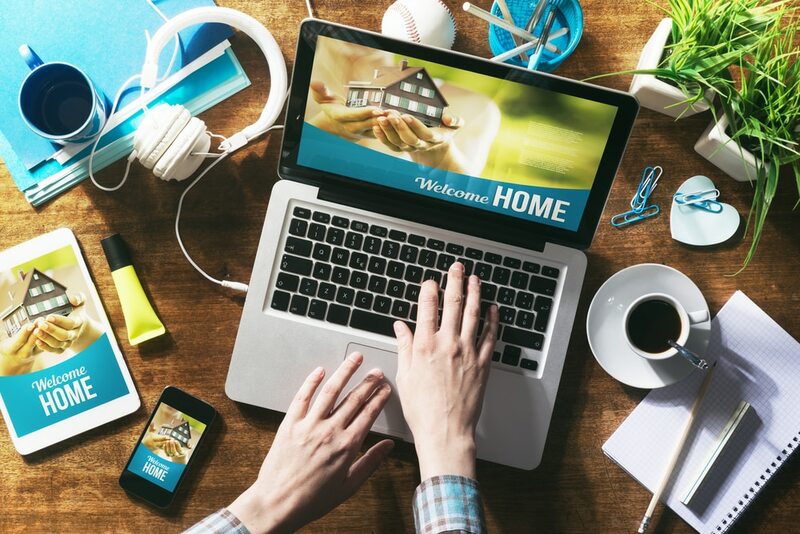 The most effective website designs for real estate emphasize a clean, clutter free design that makes it easy for visitors to access key features. Start by building a minimalist look for your homepage: choose a full-screen photo or video of one of your featured properties for the background, then place your IDX search form in a central location so visitors are naturally drawn to it. Use flat design on all your page elements, including your menu bar, navigation elements, etc. to complete your clean, crisp look. Flipping through webpages on a smartphone is a hassle, even when buttons are appropriately sized to operate with thumbs. Since so many visitors will be accessing your real estate website via their smartphones, steer clear of old website design rules that call for an abundance of pages. Instead, condense several webpages into a single long scrolling webpage. Combining shorter pages into long, scrolling pages will allow you to organize your real estate website into Neighborhood pages with sections for schools, parks, features, etc. Pair this condensed format with local keywords to create local real estate marketing strategies that can’t be beat. The most effective mobile website designs for real estate use condensed 3-bar navigation menus instead of traditional, spread-out ones. This ensures your navigation elements are kept out of the way until users need them. Make your navigation menus “sticky” so they stay with visitors as they scroll down your pages. Using this format for your real estate web design ensures your site will provide a fantastic user experience for visitors whether they access your website on a desktop, laptop, or mobile device. When you’re ready to move up to a more effective real estate web design, call on the marketers at For Sale Marketing. As a leading real estate website design agency in South Florida, we have helped countless real estate professionals develop an effective online real estate marketing strategy using a responsive real estate website design with lead generating forms, dynamic SEO content creation services, detailed marketing analytics, and more. Contact us at For Sale Marketing today at 954-779-2801 for the expert real estate web design services to create a highly effective real estate website design your agency deserves!